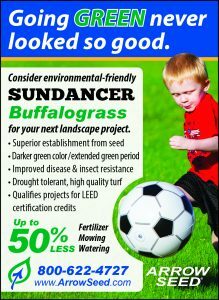 Sundancer Buffalograss is the fastest establishing, darkest green, most drought tolerant, and most widely adapted buffalograss on the market today. As a result Sundancer is a great fit for low maintenance areas, such as medians and industrial areas. Sundancer will also make a great lawn that takes minimal watering, mowing, and fertilizing. Sundancer also has improved disease and insect resistance compared to other varieties. Sundancer was released in 2014 in cooperation with the Native Turf Group and University of Nebraska-Lincoln. Seed in late spring to early summer when soil temps are 50 degrees or above. 3-4 lbs /1,000 sq ft for soil stabilization.